Less Than Intimacy took its title from the definition of ‘love’ in the English-Greek phrasebook I’d bought on my trip to Corfu with Jane Simmonds that summer, at the end of my first year at Newport Art School. Jane and I got off the plane in Corfu not knowing if my brother Miles had got the postcard I’d sent the week before, telling him we were coming to visit - he was working there as a joiner, doing up a holiday mansion belonging to some tycoon from the Greek mainland. Luckily, my brother had gone into Corfu town earlier that day to pick up his post and was there waiting for us outside the airport. And then Jane and I got a job working for the same guy, and were able to live in the downstairs quarters under the main house for the two weeks we were in Corfu. Once back from Corfu, I proposed that we present our experience at the Midland Art Performance Art Platform, a festival of live art in Nottingham. I think our name came from Stuart Crundwell, a student in the year above us who was on the BA Film course, and one of Jane’s flatmates, who’d devised the phrase ‘dark bananas in the park’ as a way of familiarising people with the Newport accent. This performance was, I believe, our first venture as Dark Bananas, and the organisers who’d booked us kindly paid for our return train fares from Newport to Nottingham and an overnight stay in a B+B. The performance was constructed as a series of tableaux vivants, reflecting our passion for photo love stories and the stereotypical encounters Jane and I had observed on Corfu between young English women on holiday and the local youth, and our own experiences when we went dancing after work. The sound of a passenger jet taking off accompanied the intro sequence of re-photographed images from package holiday brochures to Corfu. Pamela Cole and I were Julie and Sandra, Jane Simmonds and Nicole T Murray were Costas and Nico. “Are you accompani-ed? … I should be happy if I knew at my company offered you even the least pleasure. … Honey, don’t ever leave me… I want you always near me! I am jealous of you.” One of the male voices we recorded reading out English phrases from a page in the phrase book is likely to belong to Metin Hussein, who shared a house with Pam and was in the same year as us doing BA Fine Art. To reinforce the gender roles, Jane and Nicole had their hair slicked back and wore black, Pam was in a pink top and pale blue trousers, I bought a pink ra-ra skirt and high-heeled blue suede sandals and had long hair. I wrote the titles and credits in deep pink lipstick and nail varnish. Less Than Intimacy from Sundog Media on Vimeo. I also showed my early videos at the Performance Art Platform exhibition on a gigantic monitor in the gallery upstairs. 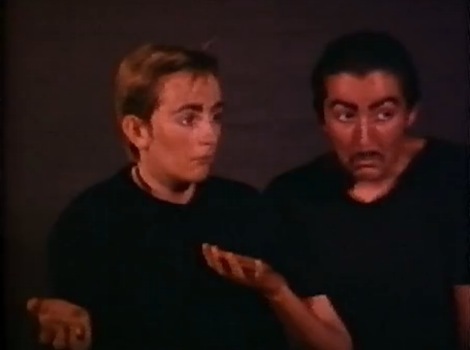 In 1984 the video version was included in New Contemporaries, the annual showcase of recent art graduates’ work, which was held at the ICA - we didn’t graduate until 1985, and forgot to say that we were still students on our application form. The Dark Bananas’ portrait which accompanied our work in the New Contemporaries exhibition catalogue was a quartet of black and white images taken in a photo booth, of the four of us with some bananas.